The Boston Bruins grades continue to roll on. 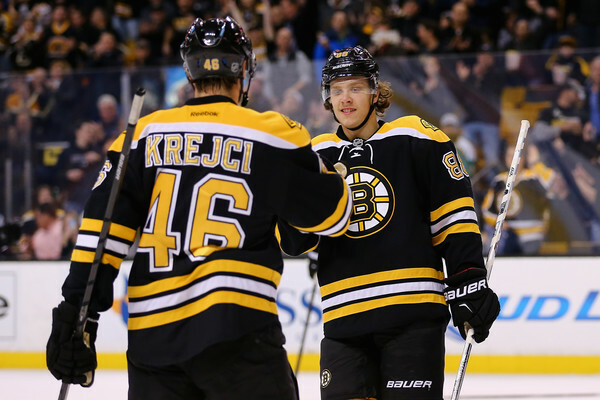 Today we look at the two David’s – Krejci and Pastrnak. Krejci is a hard player to figure out. The Bruins had to deal with some rather inconsistent play from the 31 year old on each end of the ice. Krejci tied his career high of 23 goals and was the center on the Bruins second line for the majority of the season. That line in general struggled to create offense throughout the year, but his play was enough to keep the ship afloat. While his offensive play at center in the regular season was well enough to help the Bruins earn a spot in the playoffs, he completely disappeared when it came time to face off against the Senators. To be fair, late in the season he was dealing with an injury and didn’t appear in the series until game No. 3. But, his performance was still alarming as Krejci failed to score a single point and mustered only three shots during the entire series. The alternate captain was a liability when the Bruins found themselves on defense. A -12 is quite shocking given that he scored over 20 goals. In his brief playoff appearance, he posted a poor -1. A healthier 2016-2017 campaign should produce better results for Krejci after a disappointing end to the season. The 2016-2017 campaign was a breakout season for David Pastrnak. The third-year right winger more than doubled his career-high in assists and goals. His offensive production was enough to earn him a spot on Boston’s top line alongside Brad Marchand and Patrice Bergeron. He would continue his solid play into the postseason, however his offensive production was put in check only recording two goals and two assists in the playoffs. Pastrnak also constantly found himself in the penalty box come playoff time. When the season was on the line in overtime of game No. 6, Pastrnak committed a foolish holding penalty that resulted in a power play goal. Effectively ending the Bruins season. Having now completed his entry level contract thus making him a restricted free agent, Pastrnak has expressed interest in returning to the Bruins.